Travertine is a readily available product. Used primarily as a building material and floor/wall covering, travertine is versatile and creates a beautiful look to a property’s interior or exterior. However, travertine is heavy, making it rather costly to ship and distribute. In Miami, travertine is one of the most popular stone materials used for outdoor walkways, patios, and garden walls. It is also commonly used to decorate interior walls in the form of mosaics and inserts. Stonexchange, a direct importer and distributor of natural stone products, is located here in South Florida and specializes in floor tiles, window sills, and paver stones. Our company is the best priced travertine wholesaler in Miami, Florida. Travertine is a natural limestone product, formed when water seeps through a sedimentary layer. The rock hardens over thousands or even millions of years, and the contaminant particles suspended in the moisture give this stone its unique shading. Although brittle in appearance, travertine is actually very firm. When cut from a geologic formation, travertine is in the form of large slabs. These slabs are cut into thin sheets with specialized cutting saws or cables. The sheets are sold to contractors who cut the pieces into tiles, or they are sent to a manufacturer that turns them into pencils, mosaics, tumbled insert designs, or floor tiles. Most of the world’s finest quality travertine is quarried in the Mediterranean region. Shipping the stone across the Atlantic is costly, and the resulting price for the consumer is quite high. The exception to this rule is when the client purchases travertine from a direct importer that has ties to the manufacturing operation. 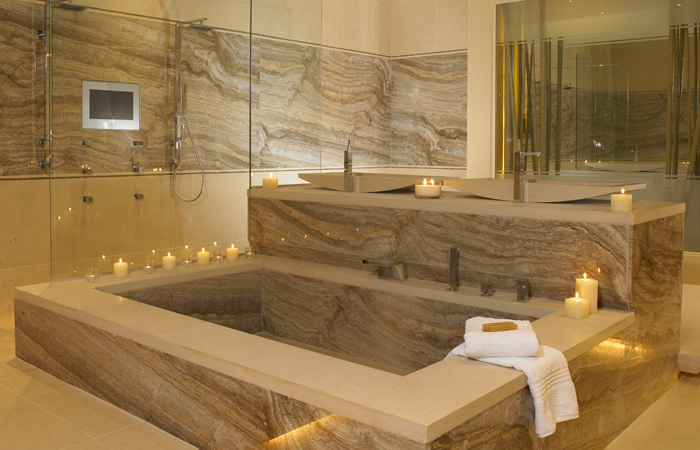 Stonexchange imports large quantities of travertine on a constant basis. We partner with manufacturing operations and are thus able to procure the finest quality product. We serve the entire Miami-Dade County area and offer rapid delivery, low wholesale prices, and the best selection of tiles, pavers, mosaics, and inserts. Travertine is usually cut into sheets averaging 5/8-inch in thickness. The appearance of the stone varies according to the type of formation from which it was extracted. The color shades also vary from off-white to dark noche. When cut and sliced into sheets, the travertine is closely inspected for uniform shading, number and size of holes, and smoothness. This stone is available in various grades. The grading process is conducted in order to determine the best use of the stone. Some travertine is full of holes that remain unfilled, and the slabs are given only a very light brushing or chiseling. Other slabs are honed, filled, and brushed. Small pieces of travertine are often put into a tumbler to give them a rustic look. A special sealer is often applied to the thin slabs, and these pieces are graded for outdoor use. The process is quite complex and involves a close inspection of the slabs to determine which procedure will result in the best appearance of the stone. The stone is then packed into large freight containers. If the pieces are to be used as tiles, the manufacturer usually cuts them to a size of 18″ X 36″ or larger. These sheets are stacked on their edges to fill a freight container. The containers are then sent by ocean freight to an overseas destination. Upon arrival at the distribution center, the crates are stored in a warehouse setting until purchased by the client. The order given by the customer will specify the grade of travertine needed, and this determines the final cost of the product. Stonexchange delivers travertine sheets, tiles, and mosaics to customers located throughout South Florida. Contractors who specialize in travertine tile setting are familiar with the different grades of natural stone. Chiseled and honed pieces are usually suitable for indoor placement because they often have no protective sealant applied. On the other hand, sheets of travertine that have been filled and honed are quite resistant to water absorption, meaning that they can be used as deck pavers or walkway tiles. These water-resistant pieces are also suitable for use as a kitchen backsplash. One of the major problems with unsealed travertine is the eventual fading in color. Unless unsealed travertine is kept dry, contaminants will leach into the stone and cause the color to change dramatically. Building plans will usually specify the grade rating for the travertine. This rating system is also known to the importer and distributor and is generally marked on the individual crates of stone when they arrive at the distribution center. Selecting the proper grade becomes an easy process, and the distributor also matches the desired color shade before sending out the order for delivery. Who Benefits From This Import Process? Stonexchange serves home improvement centers, building contractors, flooring product retailers, and large property development firms. We do not sell travertine directly to the public because we offer only full crate delivery. This is what makes our company’s products so affordable. Contractors usually need large quantities of travertine because they are setting tiles or pavers in multiple properties. Some property developments have several showcase units that include the use of more than one shade of travertine. Buying in bulk ensures that the proper shade and style requested by the consumer is found with ease. Flooring product retailers need to have a reliable source of travertine. The cost must also be attractive as this helps the merchant attract more business. Contractors who purchase from a flooring product company on a constant basis will expect the merchant to have a good supply of travertine on hand or be able to obtain it within just a few days. Breakage is a major concern when it comes to the shipping and distribution of travertine. Although the crates are packed completely full of stone sheets, some breakage does occur. This is usually caused by improper use of forklifts when transporting the material to a loading dock area, or when two crates are accidentally pushed together with excessive force. Stonexchange promises minimal breakage of product, usually less than three percent. Because we import directly from the manufacturer and deliver direct from our Miami warehouse to local clients, the product changes hands only once. This is why Miami area contractors and flooring companies prefer to do business with a local import service. Not only is the per-piece cost the lowest in the industry, the chances of excessive damage to the product is significantly reduced. Travertine is expensive unless ordered in bulk. Because of its popularity as a building material, especially in South Florida, finding the right product at an affordable price is essential. The expert sales consultants at Stonexchange are able to process orders immediately and will give honest, reliable price quotes. Our company even takes orders for non-standard sizes of floor tiles and has our manufacturing partners process custom orders within a short time frame. Select the best priced travertine wholesaler in Miami, Florida. Stonexchange offers dependable service, guaranteed quality, and exceptional pricing. Contact us today and start saving money on the finest quality travertine available. If you are a local dealer, give us a call and find out how affordable it is to order direct from Stonexchange.